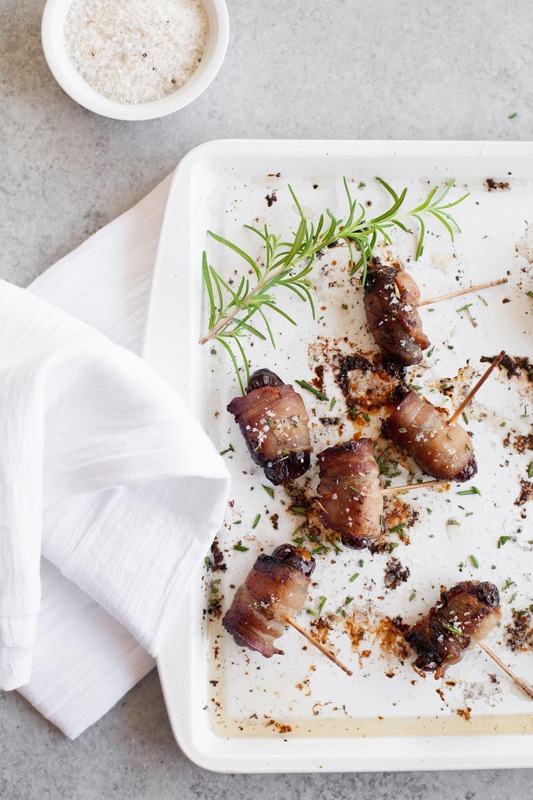 Holiday appetizers don't get much easier than these Rosemary Bacon Wrapped Dates! We’re fully into appetizer season, now, and man, I am here for it. When I was a kid, it always felt so fancy when we had appetizers for dinner, and I still love getting to sample bite-sized deliciousness whenever I can. It’s just so darn fun! Because of my restricted diet this year, I’ve had to get a bit creative with what kind of appetizers I can make and eat. Mini Christmas Quiche, while delicious, are decidedly not AIP-friendly. Cheese board? Nope. Bacon and Sriracha Deviled Eggs? Nada. Spinach Quinoa Patties? Nope, can’t eat quinoa. Caprese sticks? Nope, no cheese. Bacon Almond Cheddar Bruschetta? HA. I can eat exactly none of that. Parmesan and Sausage Stuffed Mushrooms? Maybe, but it’d take some tweaking. I could probably tweak one of my three favorite cocktail meatball recipes to work, and maybe my body won’t notice the beer in the Beer Boiled Peel and Eat Shrimp. Basically, most of my favorite appetizers are out (or require some serious reworking), so I headed into the kitchen with a clean slate (and a set of pretty restrictive but totally doable dietary rules) to figure out what holiday appetizers would work for me here and now. 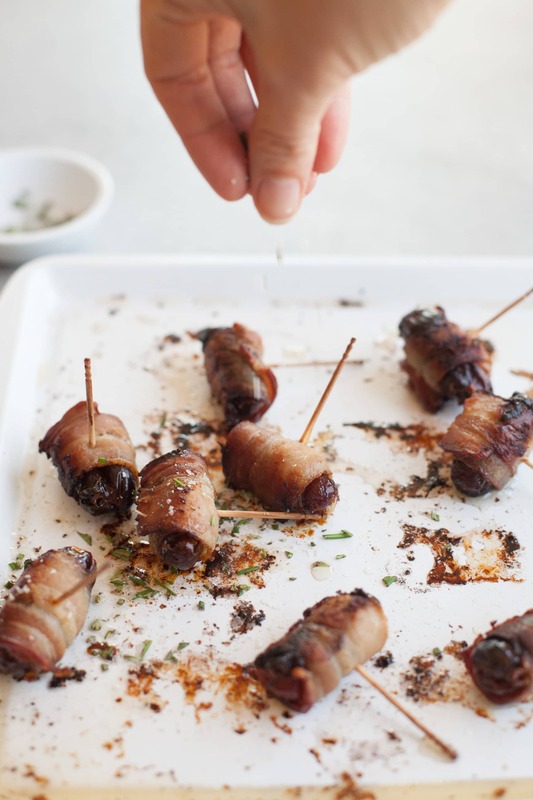 My #1 rule with holiday appetizers? They’ve gotta be speedy. My Mini Christmas Quiche (which, after making for 10 straight years of family Christmases is fully a tradition) are the exception to the rule. Everything else, I want it to be eaaaaasy. We’re all way too time-crunched during the holidays anyway; we don’t need to be spending three hours after the kids go to bed cooking an appetizer for the office pitch-in tomorrow. You know what is super easy? Wrapping a gooey, sweet Medjool date in some really great bacon and popping it into the oven, and then sprinkling it with flaky sea salt and fresh rosemary. You almost don’t even need a recipe, I just told you how to make this recipe in one sentence. 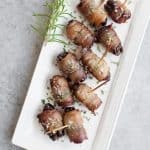 If you aren’t cheese-free like I am, I highly recommend trying to stuff these dates with a teaspoon or so of goat cheese (better if you can get the herbed kind) before wrapping them up in bacon. Oh. My. It’s like a flavor and texture explosion. A word on the dates: you’re looking for the big, fat, juicy, gooey Medjool dates—preferably ones with the pits still in them. Yes, it’s a pain to pit each date, but pre-pitted dates dry out so badly on store shelves, and it just isn’t good eats. 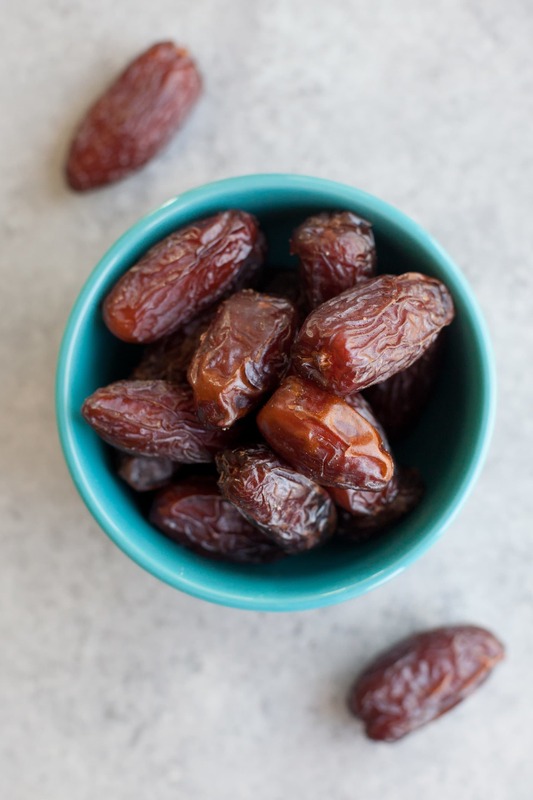 Trust me, your 10 minutes worth of pitting dates will be reward by copious ooohs-and-ahhhs from your holiday guests. 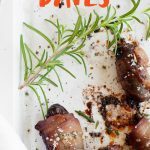 And before you ask, yes, these bacon wrapped dates can be made ahead of time! I recommend going ahead and wrapping them up and stashing them in the fridge until you’re ready to serve. Then bake off right before. You gotta love recipes that make the holidays easier! Enjoy. 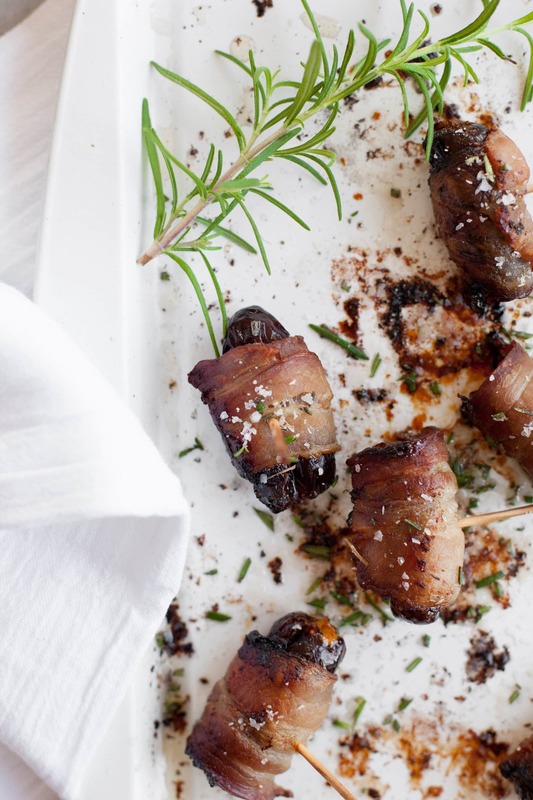 Holiday appetizers don’t get much easier than these Rosemary Bacon Wrapped Dates! If using the goat cheese, spoon about 1 teaspoon of goat cheese into the pit cavity of each date. Wrap each date in one half slice of bacon, using a toothpick to secure. Place on an ungreased baking sheet. Repeat with remaining bacon, dates, and goat cheese (if using). 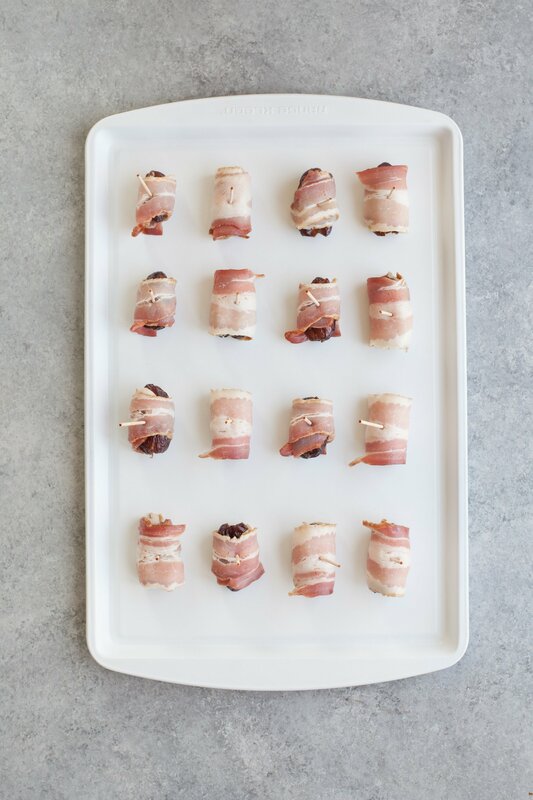 Bake in preheated oven for 12-15 minutes, using the toothpicks to flip/turn the dates so all sides of the bacon crisp up (I usually turn them 2-3 times), or until bacon is crisp. While the dates bake, mix up the rosemary and sea salt in a small bowl. Sprinkle liberally on each date immediately after coming out of the oven (it’ll “stick” better to the fresh-out-of-the-oven bacon). Serve immediately. Make sure to get the freshest, gooiest Medjool dates you can find. Skip the ones that are pre-pitted—they tend to dry out on store shelves. This is a great place to use flavored sea salt. I used black truffle sea salt on these, and it was amazing! 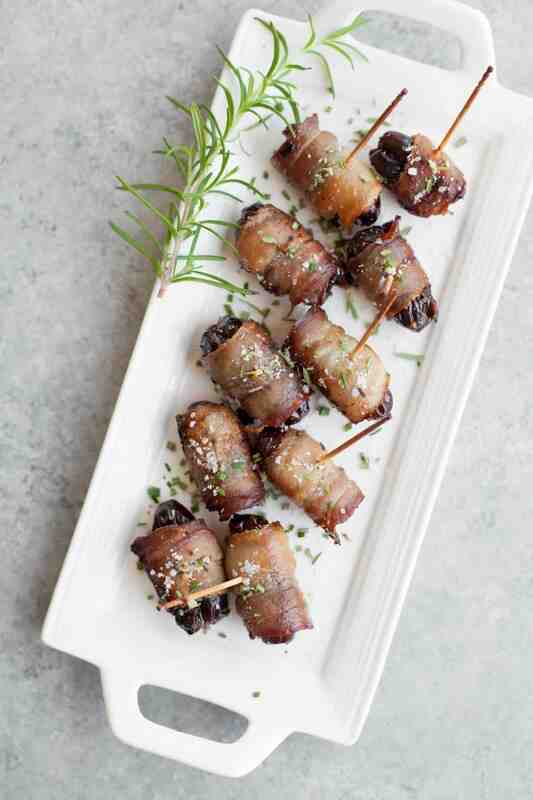 Thin bacon works the best for these—thicker stuff tends not to crisp up. To make ahead: Wrap dates and prepare rosemary mixture. Store both covered in fridge until serving time. Bake off just before serving. Oh, these sound amazing! Just this morning on tv, I saw a cook wrapping prosciutto around dates and eating them cold…..my mental tastebuds were not impressed…but warm, with rosemary, special salt and bacon…I’m drooling!!!! Thanks! !